Diablo Ballet turns 25 this season, and that’s something worth celebrating. And celebrate, they did, with a world premiere of a full-length ballet, Once Upon a Time, on March 22 and 23 at the Lesher Center for the Performing Arts. 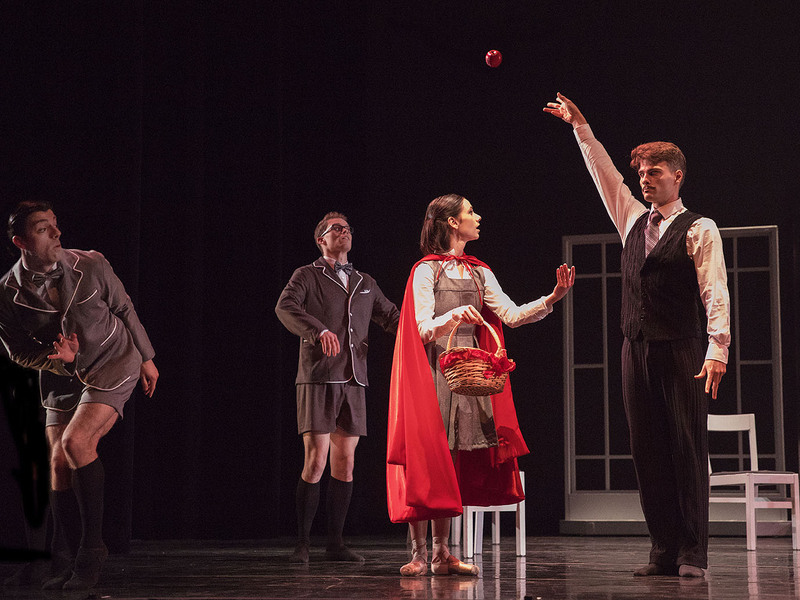 Choreographer Julia Adam has woven a host of fairytale characters—Little Red Riding Hood, Cinderella and her stepsisters, Alice in Wonderland and the White Rabbit, Sleeping Beauty, Snow White and more—into a narrative ballet that’s smart and funny, with broad appeal. The score featured George Gershwin’s An American in Paris and Benjamin Britten’s “The Young Person’s Guide to the Orchestra,” performed live (and impressively) by the Contra Costa Wind Symphony, director Brad Hogarth conducting. Michael Wells and Jackie McConnell were adorable and engaging as the Boy and the Girl around whom the story centers. The setting is a schoolroom, with Raymond Tilton their stern schoolmaster. 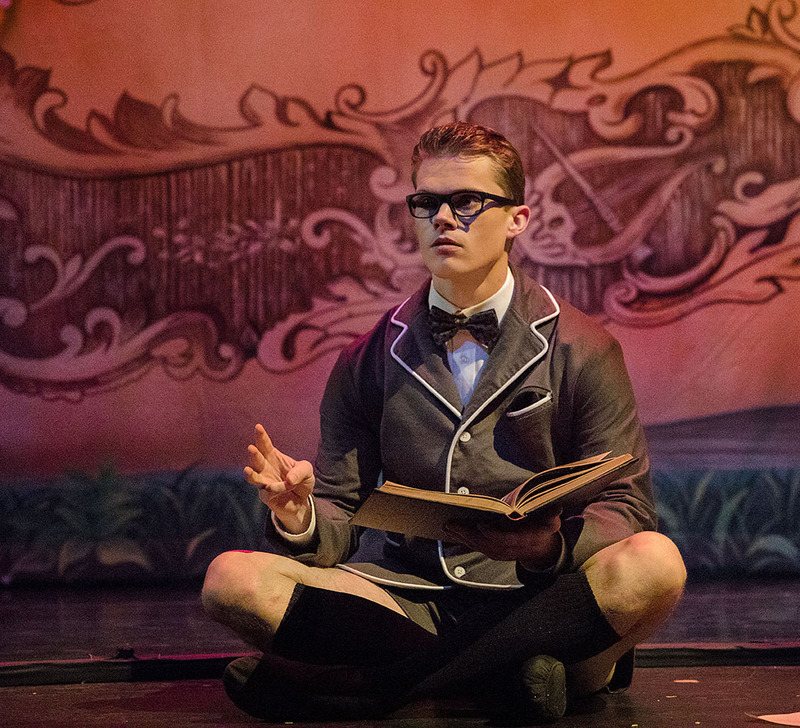 Tilton is tall, and the way he fills a stage with his presence, delivers high entrechat jumps with impeccable feet and soft landings, made him perfect for the role. The band of cheerfully unruly students included Rosselyn Ramirez and Amanda Farris as sisters, Maxwell Simoes and Felipe Leon as brothers, with Jillian Transon and Jacopo Jannelli completing the ensemble. Adams, a critically acclaimed choreographer with over 70 works to her name, has concocted a delightful romp of a ballet that holds equal appeal for adults (whew!) as well as children. Buoyant lifts and jumps abounded. Gorgeous partnered leaps from Ramirez and Farris were ably supported by Simoes and Leon (who later charmed the audience with their Tweedle Dee and Tweedle Dum). Adam’s choreography is both lushly classical and playful, such as when one partnered lift ended with forklifted arms for the lifter, the female’s legs out in the splits, feet flexed. Tilton’s sauté arabesques commenced a “follow the teacher” line of dancers. Wells promenaded in an attitude that sent his back leg over a sitting girl’s head. In the back row, dozed Jillian Transon (a precursor to Sleepy of the Seven Dwarves fame?) There was always something fun to watch. Antics abounded until the moment the Boy received a thump on the forehead that knocked him out, and he woke, à la Dorothy and The Wizard of Oz, in a place populated by fairytale creatures. The ballet, in two scenes, runs 45 minutes, which proved the perfect amount of time for Saturday afternoon’s family-friendly audience. The kids loved the production; their rapt silence was punctuated only by excited whispers each time a new fairytale character came out. For the adults, subtler entertainment: Raymond Tilton stole the show more than once in his various en travesti roles, including Cinderella’s stepmother, the evil queen from Snow White, the Queen of Hearts from Alice in Wonderland, where he perfectly balanced hilarity and authority. Transom, new to the company via the San Francisco Ballet, was a grace-laden fairy godmother with lovely piqué arabesques. Ramirez and Farris, always strong, lyrical dancers, entertained as Cinderella’s two stepsisters. Jacopo Jannelli’s White Rabbit was so funny, with rabbit ears that quivered so realistically, they made me laugh like a kid. 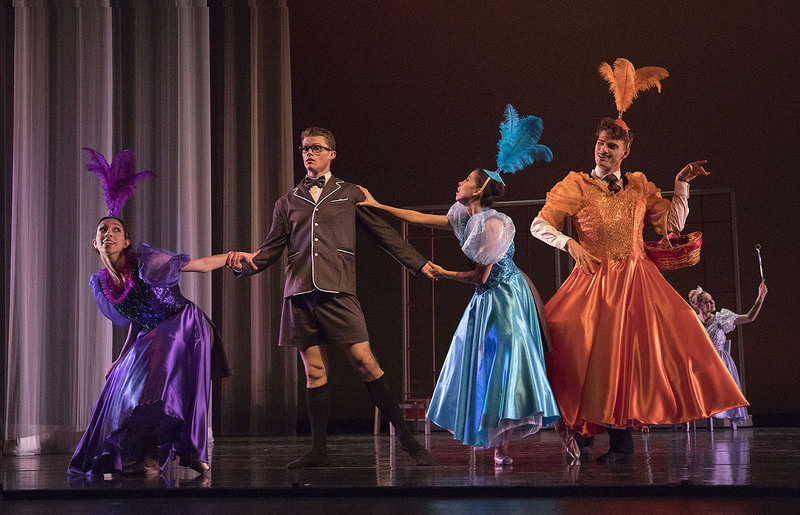 The troupe is small—only ten dancers—and for a ballet packed with multiple fairytale characters, it meant dozens of fast changes in and out of Mario Alonzo’s costumes. A decision to incorporate tie-in-the-back costumes was a good one, clever, effective and efficient. It also helped the kids (okay, and the adults) keep track of who was who, through all the fast changes. Costuming grew purposely convoluted later on, to great comic effect, as stepsisters Ramirez and Farris marched out with both dresses and dwarf beards. Scene one’s schoolroom motif returned when a huge load of papers was released from above like confetti, highlighted by Jack Carpenter’s lighting. And in the closing moments, as the Boy whirls the Girl around, her legs flying out, there’s a second paper drop, this time red bits, against a red glow (think: Red like the Riding Hood), and it was beautiful to watch as the curtain descended. A great ending to a great production. 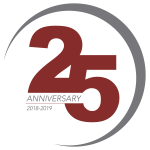 The program also included a short film, “From the Foundation to the Pillars: A Diablo Ballet Retrospective,” by award-winning filmmaker, Walter Yamazaki, to help commemorate the 25th anniversary of this gem of a company, based in Contra Costa County. “Looking back on 25 years warms my heart to know that Diablo Ballet’s mission has remained committed to enriching, inspiring, and educating children and adults through the art of dance,” artistic director Lauren Jonas shared in program notes. In this endeavor, the company has been wildly successful. Their PEEK Outreach Program, which began with one classroom in 1995, is now in six schools once per month for the entire school year, serving Bay Point, Hayward, Martinez, Oakland and a special-needs class in Walnut Creek. In addition, they are in their fourth year of working with at-risk teen girls incarcerated in Juvenile Hall. And since 2018, they’ve touched the lives of mentally ill and developmentally disabled individuals at a rehabilitation center in Castro Valley. How I feel about Diablo Ballet was epitomized by a post-performance moment just outside the auditorium, when the lovely, smiling Jackie McConnell, still costumed as Snow White, squatted down and beckoned two little girls in their own costumes to come over. Their awe and excitement and her genuine warmth were so touching to watch. I stood there, pretending like I was caught in the crush of patrons milling around, but the truth was, I just wanted to keep watching the magic that every member of this company passes on, onstage or off. (March 26, 2019) WALNUT CREEK — As part of its 25th Anniversary, Diablo Ballet announced today that it will be opening its own ballet school at the end of summer at Performing Academy’s Diablo location in Pleasant Hill. Classes will be offered to students ages three through adult who enjoy dancing as well as those who wish to pursue a professional career in ballet. The Diablo Ballet School will be the first in the East Bay to be run by a professional ballet company. Under the leadership of Lauren Jonas, Co-Founder and Artistic Director of Diablo Ballet and School Principal and company dancer, Raymond Tilton, the School has a dual mission: to train classical ballet dancers who wish to pursue a professional career in ballet and to offer young children and adults in the Bay Area an introduction to classic ballet and the joy of dance by professional dancers. The school will be located at the Performing Academy Diablo location in Pleasant Hill. This location will also be the new home of Diablo Ballet’s company rehearsals. Classes will range from Pre-Ballet to Adult Ballet classes, including Ballet I, Ballet II, Ballet III, Intermediate and Advanced Ballet. Students will have performance opportunities each year and Intermediate and Advanced Ballet students will be given the opportunity to perform with Diablo Ballet in one program during the Company’s regular season. Registration will begin in May on the company’s website. 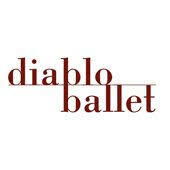 For information, please call (925) 943-1775 or visit www.diabloballet.org. This entry was posted in Ballet and tagged ", "Once Upon a Time", “From the Foundation to the Pillars: A Diablo Ballet Retrospective, Amanda Ferris, Ballet for children, Ballet for families, Ballet in Contra Costa County, Ballet in Walnut Creek, Benjamin Britten’s “The Young Person’s Guide to the Orchestra, Brad Hogarth, Contra Costa Wind Symphony, Diablo Ballet, Diablo Ballet to open ballet school, Diablo Ballet turns 25, Felipe Leon, George Gershwin's An American in Paris, Jack Carpenter, Jackie McConnell, Jacopo Jannelli, Jillian Transon, Julia Adam, Lauren Jonas, Mario Alonzo, Maxwell Simoes, Michael Wells, PEEK Outreach Program, Performing Academy Diablo location in Pleasant Hill, Raymond Tilton, Rossalyn Ramirez, Walter Yamazaki on March 26, 2019 by admin. With The Sleeping Beauty all wrapped up at the War Memorial Opera House, it’s officially the halfway point for San Francisco Ballet’s 2019 repertory season. Last season’s Unbound: A Festival of New Works (which I blogged about HERE) gave the company twelve world premieres, several of which are being repeated this season. But 2019 brings its own two world premieres, which are forthcoming, in Programs 5 and 6. Program 5, “Lyric Voices,” which runs March 27 through April 7, features the world premiere of Yuri Possokhov’s “. . . two united in a single soul . . .” It’s choreographer-in-residence Possokhov’s 15th work created for the San Francisco Ballet, and he’s drawn from the Greek myth of Narcissus, the hunter who falls in love with his own reflection in a forest spring and wastes away, pining for unattainable love. 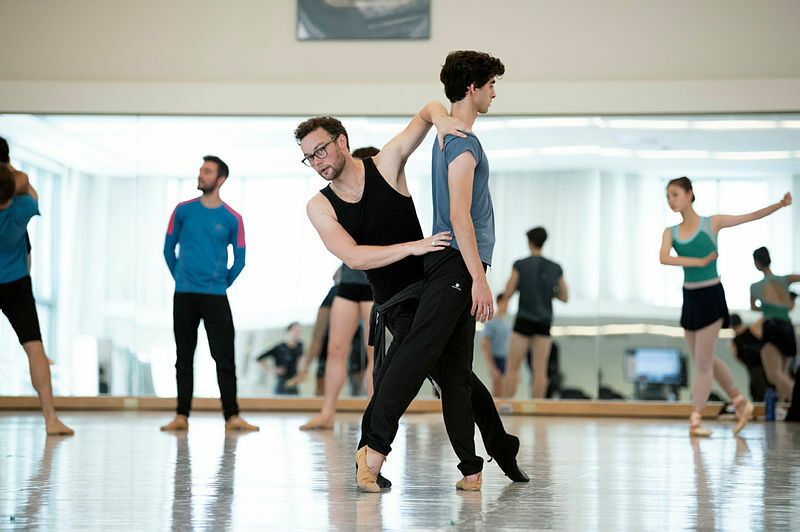 Possokhov, whose work for the San Francisco Ballet includes The Rite of Spring, Firebird and Swimmer, utilizes thirteen dancers, including Narcissus, who explore moments of connection, reflection and refraction. The ballet’s music holds its own allure to me. Possokhov commissioned a score by Russian composer Daria Novo, who has fused arias by Handel—performed live, in rotation, by countertenors Aryeh Nussbaum Cohen and Matheus Coura—with electronic elements (audio plug-ins, libraries, sound effects) and her own music. The music, the countertenors, might sound surprisingly familiar to some. Remember that 1994 movie, Farinelli, a biographical drama about the 18th-century castrato Carlo Broschi? “Lyric Voices” also includes two ballets returning from last year’s Unbound Festival. They are Trey McIntyre’s Your Flesh Shall Be a Great Poem and Christopher Wheeldon’s Bound To. Additional information about the program can be found on San Francisco Ballet’s website, in its Discover section. Dates run Wed March 27 to Sun April 7 (concurrent with Program 6). Tickets start at $32 and may be purchased via the Ticket Services Office at 415 865 2000, Monday through Friday from 10 am to 4 pm or online at www.sfballet.org. I can’t stop thinking about the music from Farinelli –– it’s a favorite soundtrack of mine. I have a hunch Possokhov’s ballet will include the gorgeous “Lascia Ch’io Pianga” from Handel’s Rinaldo, so to get you in the mood, here you go, something for my ballet readers and classical music readers alike. And now about the World Premiere for Program 6, Liam Scarlett’s Die Toteninsel. It, too, includes a stunning, memorable work of classical music, Rachmaninoff’s “The Isle of the Dead.” Die Toteninsel is its German translation, and is also the name of the iconic painting by Swiss Symbolist artist Arnold Böcklin (see the embed below). Rachmaninoff’s symphonic tone poem, like the painting, is stirring and spooky and amazing; it made the list for my “10 Spooky Classical Faves for Halloween” post, which you can find HERE. English choreographer Scarlett, artist in residence at The Royal Ballet, has created other memorable works for The San Francisco Ballet: Hummingbird, Fearful Symmetries and Frankenstein. Similar to the latter, Die Toteninsel exhibits the darkness and uneasy qualities of beauty (or, paradoxically, the beautiful qualities of darkness and unease). As Caitlin Sims explains in program notes, Scarlett uses the music and its history as a jumping off point for a more abstract work exploring the deep-rooted questions about what lies beyond this life. If Scarlett’s Frankenstein was a choreographic novel, his new ballet is more a short story—in which symbolism, movement motifs, and ambiguity both color the work and give viewers room to make diverse, individual interpretations. Scarlett draws upon the music’s repetitiveness and its unique 5/8 time signature in creating movement that grows and builds, then unexpectedly echoes itself. As a central couple emerges, surging forward and sweeping back in great arcs, their movements are reflected by groups that form and dissipate as easily as waves, giving the ephemeral “a sense of weight, and passing through one another,” says Scarlett. Give the music a listen. It’s stunning. And the image, by the way, is the famous painting. Also featured in Program 6 are Justin Peck’s 2015 Rodeo: Four Dances and Arthur Pita’s Björk Ballet (from last year’s Unbound Festival). Additional information about the program can be found on San Francisco Ballet’s website, in its Discover section. Dates run Friday March 29 to Tuesday April 9 (concurrent with Program 5). Tickets start at $32 and may be purchased via the Ticket Services Office at 415 865 2000, Monday through Friday from 10 am to 4 pm or online at www.sfballet.org. This entry was posted in Ballet, Classical Music and tagged ". . . two united in a single soul . . ." ballet, "Lascia Ch'io Pianga" from Handel’s Rinaldo, ballet at War Memorial Opera House, Caitlin Sims, Castrato and countertenor, Christopher Wheeldon's Bound To, countertenors Aryeh Nussbaum Cohen and Matheus Coura, Daria Novo, Die Toteninsel, Handel arias in ballet, Joseph Walsh, Liam Scarlett, Lyric Voices, Movie Farinelli, Music sung by castrati, Myth of Narcissus in ballet, Program 5, Program 6, Rachmaninoff Isle of the Dead, San Francisco Ballet, Space Between, Symbolist artist Arnold Böcklin, Trey McIntyre’s Your Flesh Shall Be a Great Poem, Unbound Festival of New Works, Wei Wang, Yuri Possokhov on March 20, 2019 by admin.